A kilt costume will ensure that you are appropriately dressed, regardless of which function or occasion you are attending. So what is it that makes Scotland's National Dress, such a favourite with people around the world? Well, full Highland Dress is arguably the most elegant, comfortable and stylish costume you can wear! Have you been invited to a formal occasion, and want to make an impression? 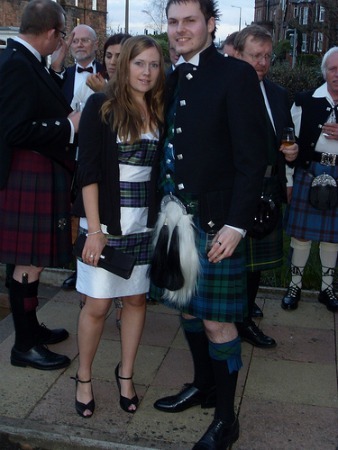 The photo below shows how a group of Scotsmen have dressed for a Burns Supper. Burns Night which is celebrated in Scotland and many other countries around the world, falls on the 25th January. Notice the different tartans on show in this one photo, and also the young ladies dress, with tartan incorporated into its design. There is no better way to attend a formal occasion, than to attend wearing full Highland Dress. I have done just that on many occasions, for instance I got married in my kilt, If you would care to see some photos of my wedding, just follow the link. But it doesn't have to be a formal occasion in order to wear your kilt, are you planning to attend a Highland Games any time soon? 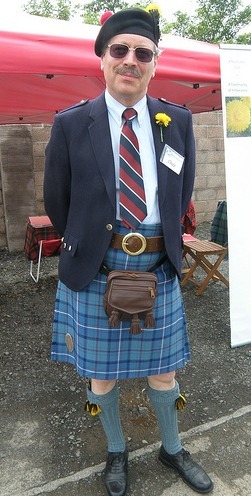 The next photo shows a kilt costume which is often worn to Highland Games, and other day time activities. The Argyle kilt jacket worn in this photo, is synonymous with day wear. In fact day wear is often called the Argyle Outfit. How about wearing your kilt to the office, instead of a stuffy lounge suit? You would be surprised how practical a kilt is when accessorized for day wear. A kilt is warm in winter and cool in summer, do you know of any other outfit you can say that about? And it is guaranteed to get you noticed, in fact people are inclined to start up a conversation just because you are wearing a kilt. 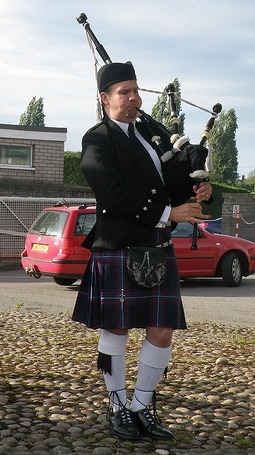 Another famous sight is of course the piper, and his kilt costume can also change from semi-formal to full Highland Dress. The photo below shows a piper welcoming guests at the National Railway Museum in York, notice he is also wearing day wear, Argyle jacket and semi-dress sporran. So how many different ways are there to wear a kilt? To many to write about in detail on this page, but the kilt outfits page does go into detail on how to dress your kilt both up or down. Another benefit of a kilt is that when properly cared for, it will last a lifetime, mine is fifteen years old, and looks as good today as when I first bought it, as do all the kilt accessories that go with it. Yes, it was the most expensive outfit I have ever, or will ever buy. But it has been outstanding value for money! So if you want something really special to wear, that will make you feel like a million dollars, my recommendation, buy a kilt costume. For more information on this or any other aspect of the web-site, drop me a line using the Contact Us page, I love to hear from my visitors. Return from Kilt Costume to Men in Kilts.